NASHVILLE, Tenn.–(BUSINESS WIRE)–TransCore has been awarded two separate toll contracts to convert legacy automatic vehicle identification (AVI) toll systems to SunPass® interoperable and toll-by-plate all electronic toll systems in Miami-Dade County on three causeways that provide access to some of Greater Miami’s famous beaches and recreational areas, including South Beach. Contracts include the Broad Causeway for the Town of Bay Harbor Islands and for the Miami-Dade County Rickenbacker and Venetian Causeways. The Rickenbacker Causeway links Miami to Key Biscayne, home to the annual Sony Open Tennis Tournament. The projects will be managed from TransCore’s South Florida office, and have a combined contract value of approximately $13 million, including system delivery and maintenance. Both systems will be operational by spring 2014 and make both Bay Harbor Islands and Miami-Dade County systems compatible with the SunPass back office system. For the Town of Bay Harbor Islands, TransCore will convert a bi-directional cash toll plaza to open road tolling using TransCore’s Infinity Digital Lane System. Similarly, for Miami-Dade County, TransCore will convert Rickenbacker and Venetian Causeway toll plazas to all electronic tolling. The Venetian Causeway toll plaza has six lanes and processes two-way traffic and the installation will include four lanes of bi-directional dedicated AVI. The Rickenbacker Causeway processes traffic through eight lanes for entry to the islands of Key Biscayne and Virginia Key and will be converted to four lanes of all electronic tolling. This project also includes TransCore’s Customer Account Management System (CAMS) for local management of their annual pass plans. 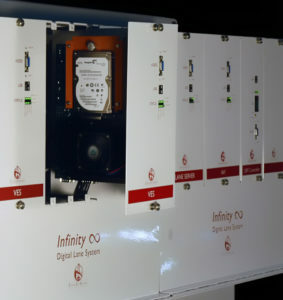 Infinity∞ Digital Lane System is blade based and comprised of independent, single function modules that can be easily replaced, upgraded, or removed in the field without affecting other modules. The architecture allows modules and functionality to be easily added or changed. With Infinity’s modular approach, it is easy to add more tolling lanes by simply adding more modules, and there is virtually no limit to the number of open road lanes of traffic that it can support. There are two primary types of blades: one is used for lane servers, VCARS® controllers, and AVI controllers and a second is used for IVIS™ controllers, vehicle profilers, and ORT zone controllers. These two blade types are used in single lanes as well as open road tolling systems. By having only two common blade types for the entire system, maintenance and inventory tasks become efficient and easier to manage. Because the architecture of the Infinity Lane System is IP-based, the physical location of the blade does not have to change in order for the blade to be interchangeable. Individual Infinity∞ blades can be easily upgraded at the end of their functional lives. This is a major innovation for the tolling industry. A typical toll system has a useful life of only five to seven years, at which time an RFP is typically issued to replace the entire system, even though the supporting infrastructure (such as wiring, network cabling, electrical cabinets, and passive components) remain viable. This is a costly and time-consuming process but with the Infinity system this mitigates such a costly and lengthy procurement. TransCore’s 79-year heritage supporting the transportation industry spans an extensive scope of expertise including toll systems, systems integration, customer service centers, design consulting, operations, maintenance, traffic management systems, intelligent transportation systems, and RFID manufacturing. TransCore has installations in 46 countries and a vast portfolio of intellectual property. In 2013, Engineering News-Record (ENR) ranked TransCore No. 169 out of the Top 500 Design Firms. Also in 2013, TransCore received the International Road Federation’s Global Achievement Award as well as ITS New York’s Most Outstanding ITS Project of the Year award for New York City’s Midtown in Motion. TransCore, now headquartered in Nashville, Tenn., operates as a wholly owned subsidiary of Roper Industries, a diversified growth company that is a constituent of the S&P 500, Fortune 1000, and Russell 1000 indices. Roper provides engineered products and solutions for global niche markets, including water, energy, transportation, medical, education, and SaaS-based information networks. ® SunPass is a registered trademark of the Florida Department of Transportation.